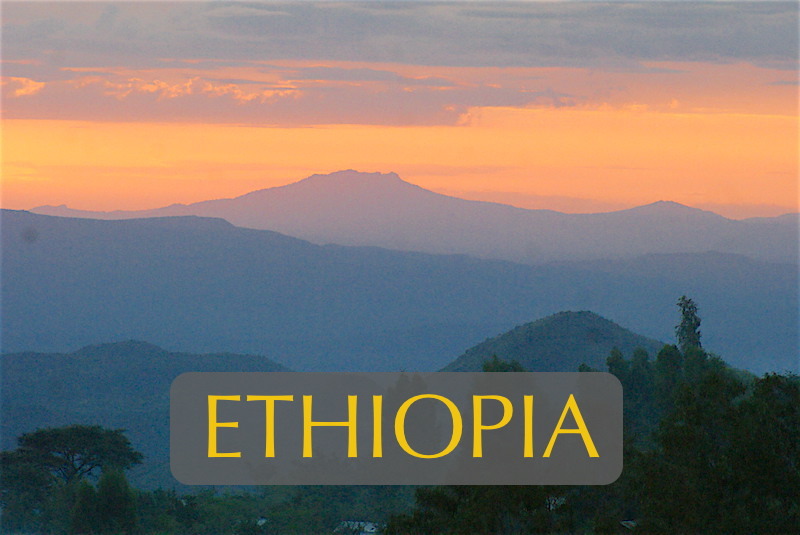 Ethiopia is one of the most fascinating countries in the world with the richest history on the African continent. Old beyond imagination, it dates back to the very beginnings of mankind. Students on this trip will see the fossil remains of world-famous “Lucy” – the most complete and oldest hominid skeleton ever found. They will view the bones of the oldest child and trace human development to the discovery of fire by Homo erectus over a million years ago. The main destination of this study adventure will be the legendary Omo River Valley; a land lost in time that is home to over 200,000 of the some of the most traditional tribes remaining on Earth. The Omo not only boasts the largest diversity of tribal groups in the whole of Africa, it has been declared a UNESCO World Heritage Site as the place where the earliest and most extensive fossil fragments of Homo sapiens have been found. The lower Omo is also one of the continents last unspoiled wilderness regions supporting lions, leopards, cheetahs, buffalos, giraffes, elephants, zebras, hippos, crocodiles and over 400 species of birds. This study adventure will not only show students Africa the way it used to be, but will immerse them in never-to-be-forgotten experiences. Students will prepare traditional foods and overnight in a beehive woven hut of the Dorze tribe high in the mountains. They will hike through the desert learning about edible and medicinal plants with the pastoral Hamer peoples and possibly take part in their “Jumping of the Bulls” coming of age ceremony. Visiting the semi-nomadic Mursi and Bena tribes, students will see incredible forms of beautification, body painting and adornments almost unrivaled on Earth. They will have tribal kids their own age adorn them, learn tribal dances, barter at tribal markets and learn planting and harvesting skills from the Konso tribe that have created the world’s most extensive hill terraces, now declared a UNESCO World Heritage Site. Service projects during this unforgettable trip will include working with children in an orphanage, planting trees to arrest soil erosion and delivering portable water purification systems to tribes people in remote regions. Students arriving on overnight flights to Addis Ababa, the capital of Ethiopia and the African Union will be greeted on arrival and enjoy a light breakfast at La Parisienne before transferring to the National Museum to view the world’s oldest and most intact collection of human ancestry. One of the highlights of the displays here is “Lucy” (Australopithecus afranses) – the most complete and oldest fossil of an upright ape ever found. Following our museum visit, we begin our journey south through the Great Rift Valley in 4WD vehicles, stopping for lunch in Ziway. Our destination this day will be in the cool green highlands of the Sedona tribes; people that weave dome-like houses from bamboo slats covered in thatch. The elegant Aregash Lodge is built in the same Sedona fashion and will provide a wonderful venue for our first night. On arrival, students will be greeted with banana and guava smoothies made from lodge’s organic orchards before taking part in a lovely coffee ceremony overlooking a deep, forested ravine. Coffee ceremonies are an important and ancient daily ritual in Ethiopia where the brew was first discovered. Long ago, a goat herder named Kaldi from the Kaffa region accidentally discovered coffee when he noticed his goats getting unusually frisky after eating the berries of a certain tree. Kaffe (coffee) is now the world’s most popular brew. What makes this sunset coffee ceremony different from all others in Ethiopia is the wildlife it draws in each night. Colubus and vervet monkeys are commonly sighted throughout the lodge grounds, but flocks of vultures and spotted hyenas also congregate here each evening. This is as close as anyone is ever likely to get to a family of wild hyenas. A special dinner and campfire ceremony will take place this evening to celebrate our first night in the African wilds as wild hyenas call in the dark. After some early morning wildlife viewing and a delicious buffet breakfast, we set off by 3WD vehicles to continue our drive past a string of beautiful lakes in the Great Rift Valley. Our first stop of the day in Awassa allows us to experience a traditional fish market. 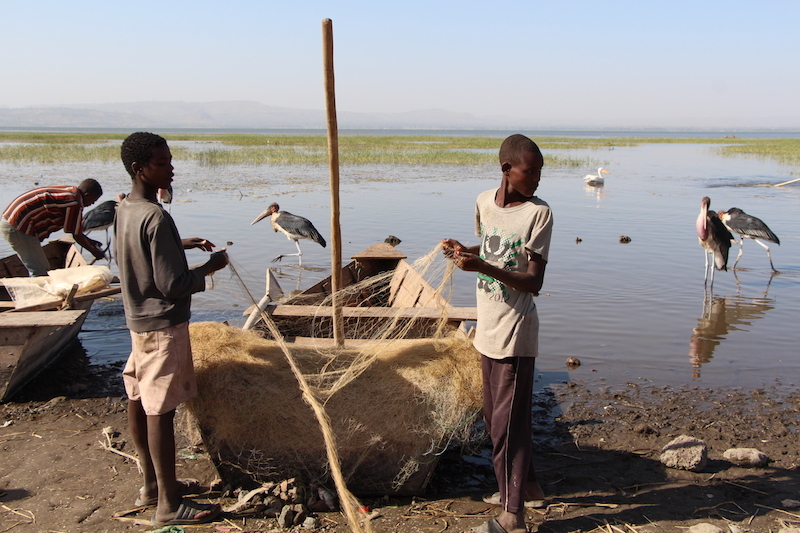 Here local kids strip the skin off tilapia fish with their teeth and large flocks of pelicans and marabou storks hang around the net boats waiting for any by-catch that might get tossed their way. There’s a nice walkway along the lake edge where students will see large numbers of waterfowl: Egyptian geese, ibis, pelicans, cormorants, storks, egrets, herons, kingfishers, plovers, stilts, storks, coots and more species to add to their ever-expanding bird list. Later in the day we may see the endemic Swayne’s Hartebeest in the Senkele Wildlife Sanctuary on our way to Chencha. Stunning views of the Great Rift Valley will now reveal themselves as we climb 2,900 meters to the cool, green highlands of the Dorze homeland. 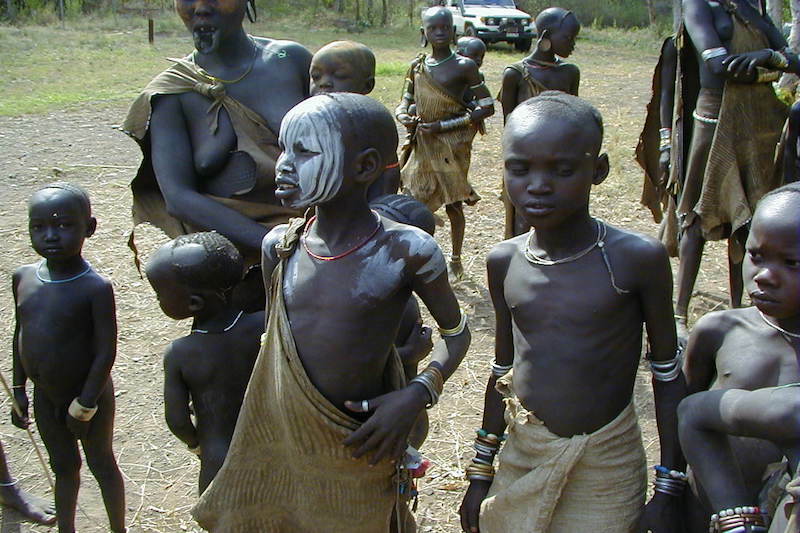 The Dorze tribe are believed to have migrated here from the lower Omo River region about 500-years ago. They are noted for their distinctive beehive-shaped huts woven from bamboo that can stand two-stories high, and last up to a century. Students will be formally welcomed and enjoy a traditional Dorze lunch and a coffee ceremony on arrival. After dinner there will be a lively dance celebration where students can learn how to dance Dorze style. Everyone is likely to be woken at first light by calls of wild ibis in the treetops surrounding our compound. As the Dorze village comes to life, we too will wash up, enjoy breakfast and begin our morning immersion into Dorze traditions. Students will learn the ingenious technique for turning the trunks of false banana trees into nutritious bread. Girls will learn how to spin cotton with Dorze women while boys learn looming techniques from Dorze men who are renowned for their weaving skills. A hike through the village will bring us to the home of a local potter where students can try their hand at fashioning a traditional clay coffee pot or other utilitarian item. Today is market day in the village of Chencha, so students will also learn about the goods that are used and traded in Dorze society. Before departing Chencha, there will be time to visit a local orphanage school where visiting students can donate supplies and assist in English language and geography lessons as they point out on a map of the world the countries they come from. It’s a 5-hour drive from the Great Rift Valley to our main destination – the remote Omo River Valley, but the scenery along the way is amazing and wildlife encounters with olive baboons, dik diks, yellow-billed hornbills, several species of guinea fowl as well as children dancing will keep us entertained along the way. A beautiful buffet dinner will be waiting for us, and our tents already pitched as we arrive at Buska Lodge Campsite near the small village of Turmi. A sharing circle under the star-studded African sky will close out a wonderful day. The acacia forest surrounding our camp comes alive with birdcalls at first light and student teams will set out with binoculars and field guides to spot and record as many species as possible. After a delicious buffet breakfast, students will have an orientation into cultural traditions of the Hamer tribe before we set off on an immersion hike into the lifestyles of these pastoral peoples. The Hamer say that without their goats they would perish, as they are the one animal that can survive the longest with limited foraging in times of drought. Hamer women wear soft goatskin skirts and tunics beautifully beaded and they grease their plated hair with butter and ochre powder to enhance their beauty. Some students may want to try this. Today we will hike with a Hamer family as they follow their herds through the desert scrub brush, learning about the Hamer use for different plants along the way. If our stay coincides with a “Jumping of the Bulls” coming of age ceremony, this will be the focus of our afternoon and our 4WD vehicles can help us get there should a location for this event be quite remote. Returning to our camp in the late afternoon, everyone can enjoy a shower and relax in the river before dinner. Black and white colobus monkeys frequent the river’s edge along with a wealth of birds. After dinner, we will gather around a fire beside the river where Hamer children will teach students the distinctive Hamer dance style called “evangadi” that involves jumping much like the Masai of neighboring Kenya. After a big breakfast we depart for Jinka, traveling through the territory of the Bena tribe. Today is market day in Key Afar, which is one of the most colorful and fascinating markets in the region. The Thursday market is visited primarily by the Tsemai and Bena tribes who bring their goats, cows, cosmetic butter, honey, tobacco, incense and other trade goods to sell and barter. There are 24 different tribes in the south Omo displaying extraordinary cultural integrity. Most are agro-pastoralists living in a psychic landscape little different from their nomadic ancestors. Some tribes number tens of thousands, others a mere 500, but all are culturally and linguistically distinct making the South Omo utterly unique. As we drive through the wilderness/cultural landscape from Turmi to Jinka we will pass from Hamer territory into Bena and Ari homelands. Borderlines are often distinguished by a simple creek or river, but territories are deeply imprinted in the tribal psyche. 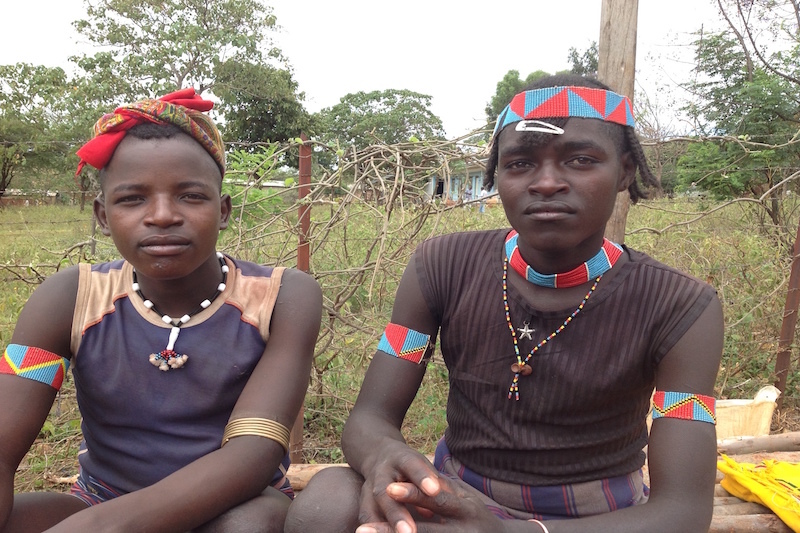 The Benna and Hamer people share not only a tribal border, but also many customs and they frequently intermarry. 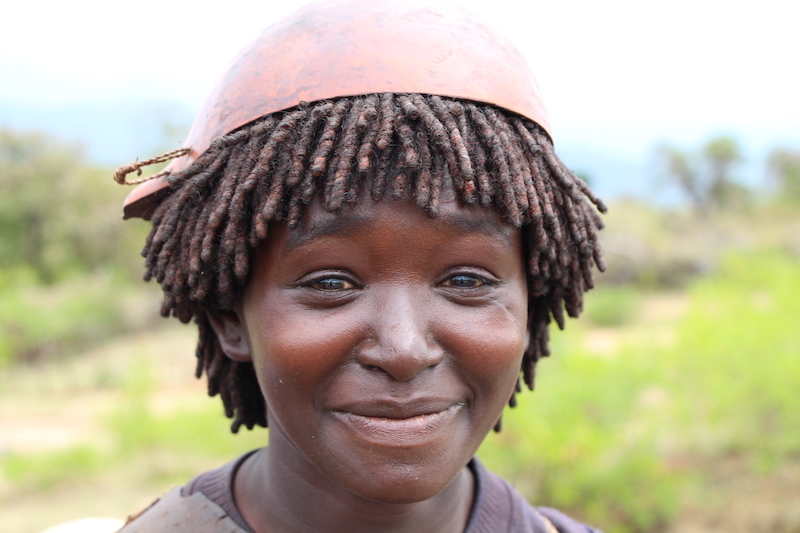 Bena women braid and grease their hair with red ochre like Hamer women, but they also like to wear a calabash (half gourd) like a helmet. Men distinguish themselves with collars and bracelets of turquoise beads and bright-colored wraps. Arriving in Jinka we will enjoy a good lunch at a local restaurant before visiting an Ari village. 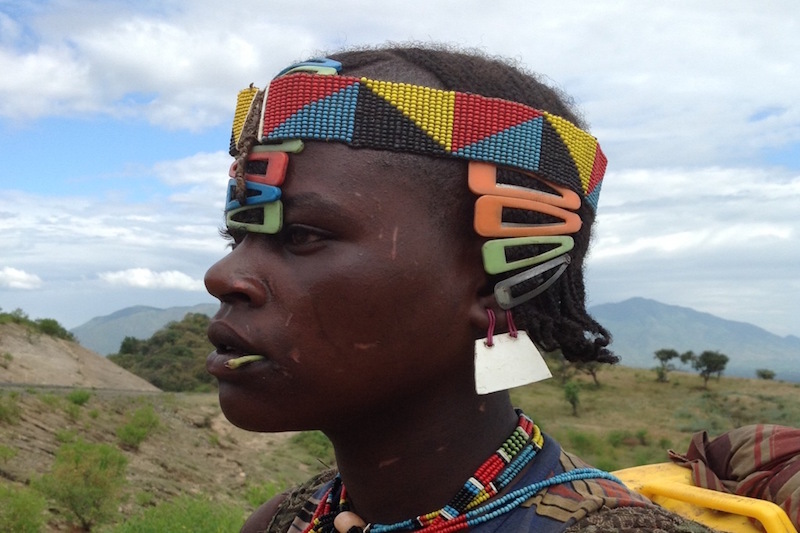 The Ari are one of the largest tribal groups in the lower Omo River valley. Basically farmers, the Ari grow a variety of grains, fruit and coffee, as well as produce excellent honey. During our village tour with an Ari guide, students will learn how to mold a clay skillet for roasting coffee, how to distill alcohol from grain, how to forge farming tools using a goat skin bellows, and how to prepare Ethiopia’s iconic bread – “ingala” by grinding and fermenting “teff” – the world’s least known but most nutritious grain. Students will learn that Ethiopia is one of seven centers in the world where humans first domesticated crops. Sorghum, barley, millet, teff and coffee are among the food crops first discovered and cultivated here. Before returning to our lodge for dinner, we will visit the South Omo Museum & Research Center high on a hill above Jinka to learn more about the 24 distinct tribes of this region. There’s also an excellent library of videos here depicting many aspects of tribal life. We get an early start this morning, leaving Jinka Resort right after breakfast and driving to Mago National Park. With a protected area of over 2,000 square kilometers and no tourism inroads at all, this is truly one of Africa’s last great wilderness areas. Driving down into the Omo River Valley we will have stunning vistas of the park. Dense acacia woodlands are interspersed with small areas of open savannah and riparian forest along the Mago River providing sanctuary to over 100 species of mammals including: lion, leopard, cheetah, jackals elephant, giraffe, zebra, buffalo and gazelles. While most wildlife here is difficult to spot due to heavy brush, baboons and monkeys are common and huge African elephants do cross the road at times. Crossing the Mago River we enter the territory of the Mursi, one of Ethiopia’s most enigmatic tribes and one of the endemic Omotic speakers. Until quite recently, the Mursi did not know that Ethiopia existed as a state; they lived in a true cultural Garden of Eden. 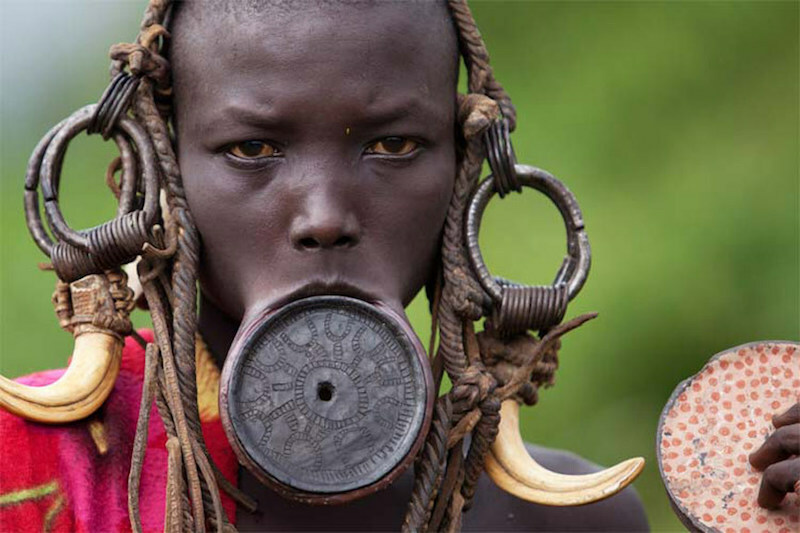 The Mursi are the most celebrated of the lower Omo group due to the quirky items they use to adorn themselves (including wild fruits, crops and warthog tusks), extensive scarification and the women’s custom of wearing plates of forged clay in their lower lips. Some early explorers and anthropologists thought that removing the lower teeth and stretching the lower lip to hold large clay plates was a deliberate attempt to make Mursi women unattractive to adulterers and slave traders. The truth is, it symbolizes a woman’s status and a woman that can stretch her lower lip completely over her head is said to be worth a small fortune in cows. There are only about 5,000 Mursi who are semi-nomadic pastoralists that measure their wealth in cattle. Students will see how the Mursi can tap the blood from a living cow for fluid and nourishment during their travels, much like the ancient Mongols. This disturbs the cow no more than a human donating blood at a blood bank. We will have time this morning for students to adorn their own faces with natural pigments through the skilled artistry of Mursi youth who will assist them. Following this fun and bonding experience, students will engage in a service project. Portable water purification units (costing approx. $50 each) can be purchased by school groups and brought with them on this trip to donate to these, and other pastoral people we meet along the way, that must otherwise rely on very muddy or contaminated water for drinking. Departing the Mursi village late in the morning, we will drive back to Jinka for lunch and then head into the homeland of the Konso tribe. These mixed agriculturalists inhabit an isolated region of basalt hills rising to 2,000 meters that are flanked on two sides by deserts. To create farmlands from this challenging environment, the Konso have constructed the largest stone-terraced landscape in the world, a landscape so unique it has been granted UNESCO World Heritage status. Our lodge tonight is constructed in the same fashion as a Konso village, but with all the amenities of a modern resort. Our “tukul” huts are beautifully crafted and have private porches with stunning views across the valley. After an excellent dinner on the patio restaurant, students will have a candle-sharing circle under the moonlight and stars of the African night. We wake early and enjoy the beauty of sunrise over the valley while eating breakfast. 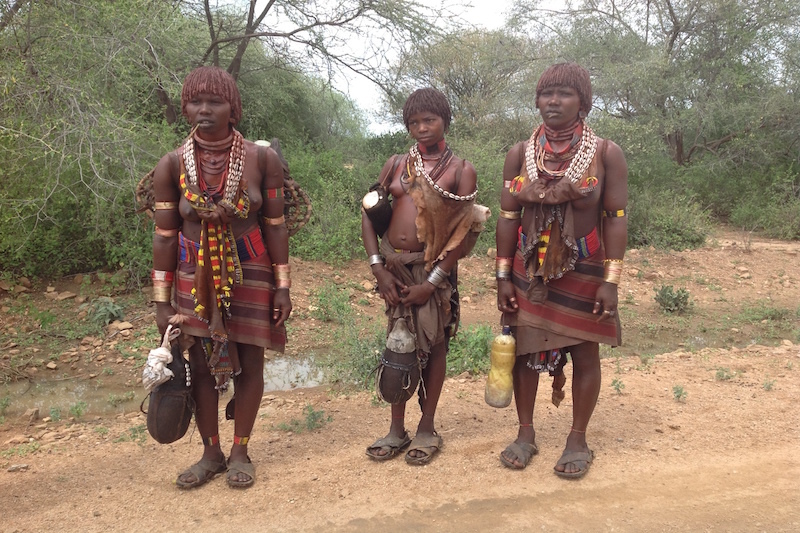 Not far from our lodge, we will visit a Konso village; distinctively different from everything we have seen thus far. The Konso build their settlements atop hills with 2-meter high stonewall to guard against enemies and dangerous animals like lions, leopards and hyenas from attacking their goats, cows and sheep. Each village is made up of a number of sub communities each with its own meetinghouse – a tall thatched-roof building decorated with ostrich eggs on top. Here all young men sleep each night, as well as married men on a rotating basis, so warriors can be mobilized quickly in case of attack. The Konso are distinct from other south Omo tribes in carving wood “waga” figures to honor the gravesites of warriors that have killed wild animals or enemies attacking the village. 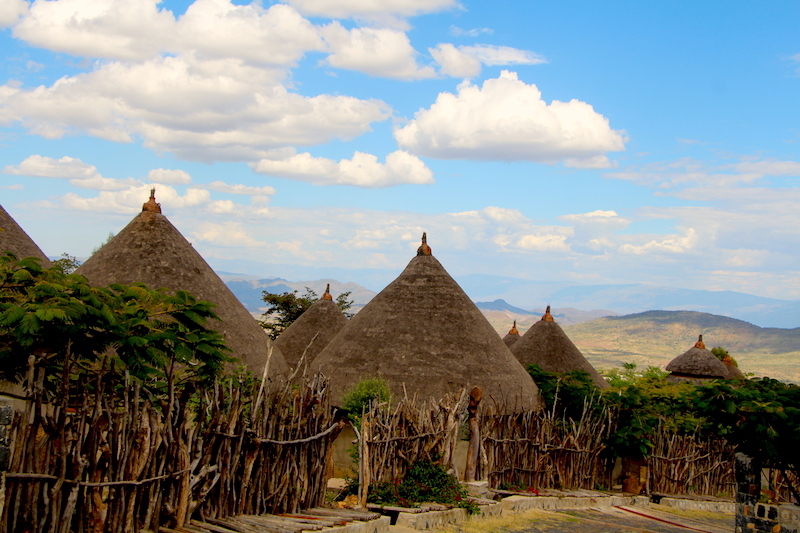 We will visit an excellent museum near our lodge to see a collection of “wagas” and learn more about Konso culture. Soil erosion from over grazing is a serious problem throughout southern Ethiopia and villages are organizing tree-planting campaigns to guard against it. Students will have an opportunity to contribute towards this effort themselves as we engage in tree planting with the Konso Development Association before we depart to Arab Minch and our beautiful lodge overlooking Lakes Abaya and Chamo, part of the string of beautiful lakes that make up the Great Rift Valley. 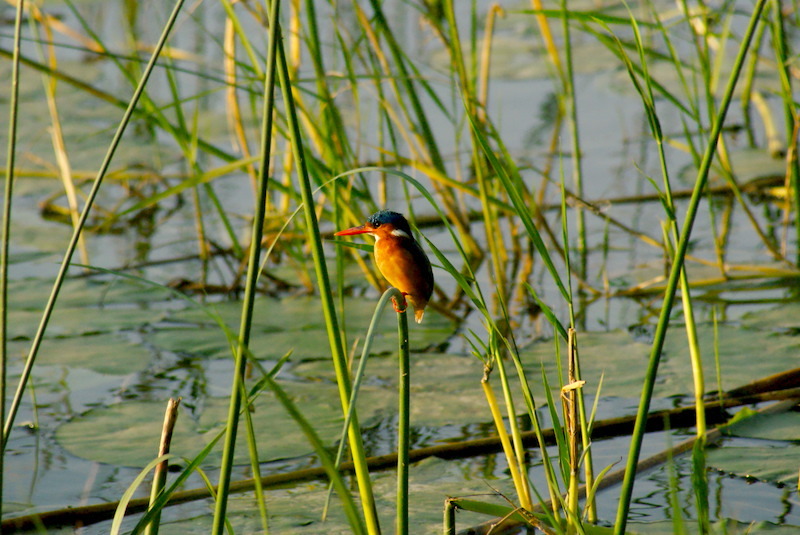 No one will want to miss the sunrise over Lake Chamo as we rise early with the birds and enjoy a delicious buffet breakfast. 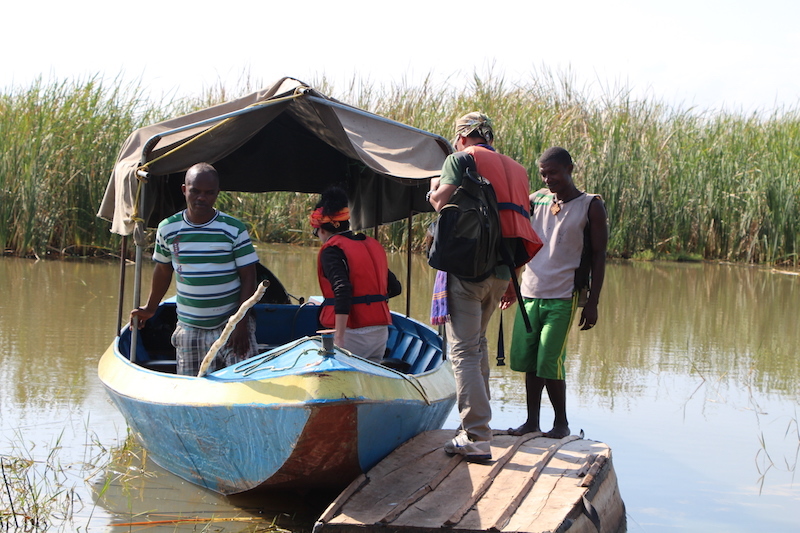 After a leisurely morning soaking in the ambience of our luxury lodge and surveying the birdlife, we transfer by vehicle a short distance to the shores of Lake Chamo where students will board sturdy boats for a morning wildlife-viewing safari. Hippos and huge crocodiles lounging on the banks of the lake and back channels will be the highlights of our 2-hour boat trip, but there is also an abundance of bird life here. Pelicans, herons, ibis, stilts, plovers, fish eagles and kingfishers are all easy to spot and the wilderness scenery around this crater-formed lake is lovely. Returning to shore, we will learn how the locals weave beehives from bamboo strips, coat them with cow dung and sweeten them with incense before placing them in trees to attract bees for honey production. We now bid farewell to our drivers and 4WD vehicles as we board a one-hour flight from Arab Minch back to Addis Ababa. Flying over the Great Rift Valley will reveal a string of seven lakes of different colors surrounded by scrub acacia forest and savannah – all part of the oldest human habitation sites on Earth. We end our extraordinary study adventure with a closing dinner featuring foods and dancing from all regions of the country. Students will then be transported to the international airport to check in for the late night flight home.